Welcome to our gallery focusing on the best bars and barn stools for your man cave. A home bar is one of those dream features that often makes the most sense in a man cave. While your living room or den might make for a decent makeshift bar, they’ll never compete with the purpose-built atmosphere of a good man cave. We’ve gathered a list of some of our favorite home bars and bar stools that will add a final touch your own man cave. Each has its own list of 10 items in a range of styles, in order to showcase the wide variety available and cover every type of man cave we’re familiar with. When you’re creating or completing your own man cave, there are a ton of considerations to make. These include the layout, features, style, and type of furniture you want to fill it with. When it comes to style, everyone has their own take on what a man cave should be. We believe this should be the first decision you make, and that the rest of the considerations follow suit. Once you’ve planned out your man cave and decided what features you want in it, you’ll want to choose the best example of those features. Because home bar sets are increasingly popular, and simply because we like them, we provided a list of our favorites. You’ll find bars in a range of styles, from fully rustic to completely modern, and a little bit of everything in between. 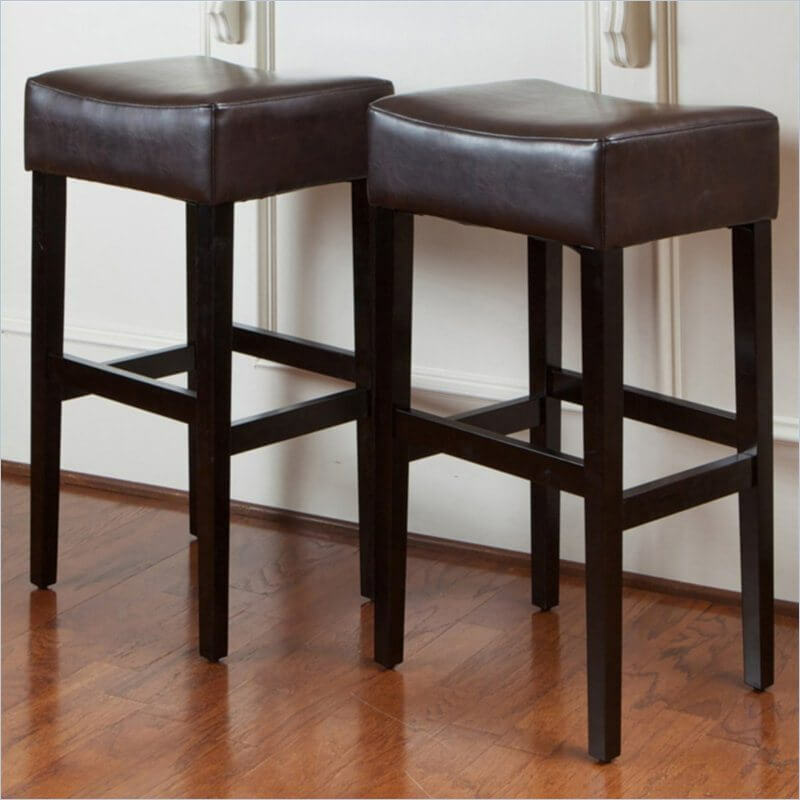 The bar stools appear in many complementary styles, perfect to match or contrast your man cave setting. We hope you enjoy this two part gallery. 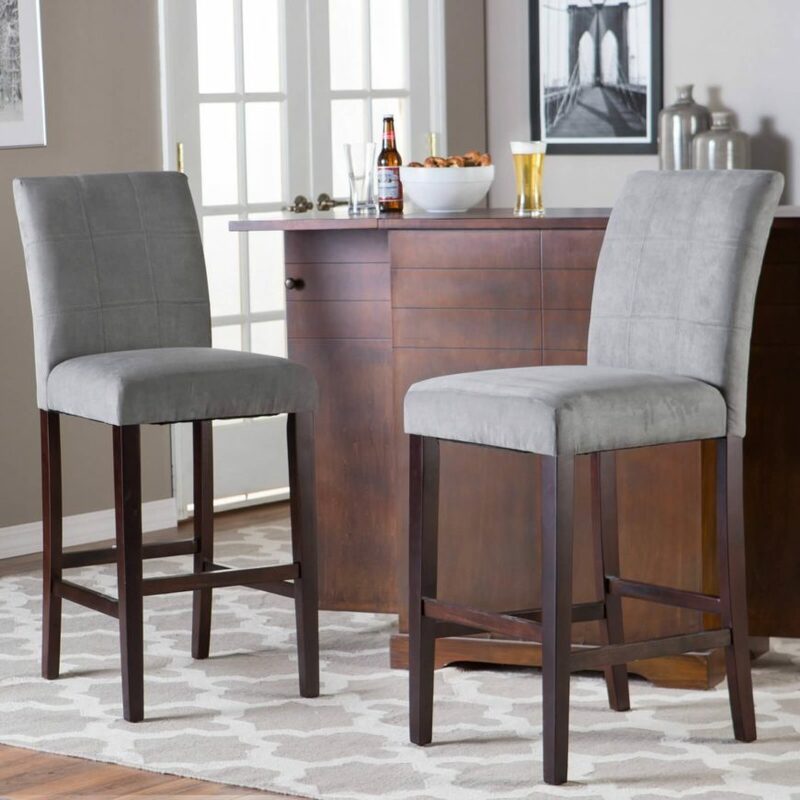 There’s a lot of wiggle room in the various styles, forms, and functions of these bars and bar stools, so you’re bound to see something you like on either list. 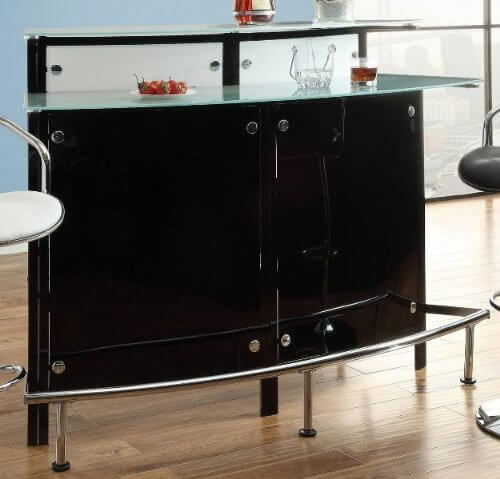 Our first man cave bar is a sleek little unit employing loads of glass for a light and airy appearance. This won’t take up a ton of space, so it can be used in a huge variety of room sizes and styles. The modern styling complements a similarly styled room, and offers plenty of space for drinks and glasses. While the front is an elegant, smooth curve presenting a singular look toward the rest of your man cave, the back side of this bespoke bar reveals a cornucopia of storage options. 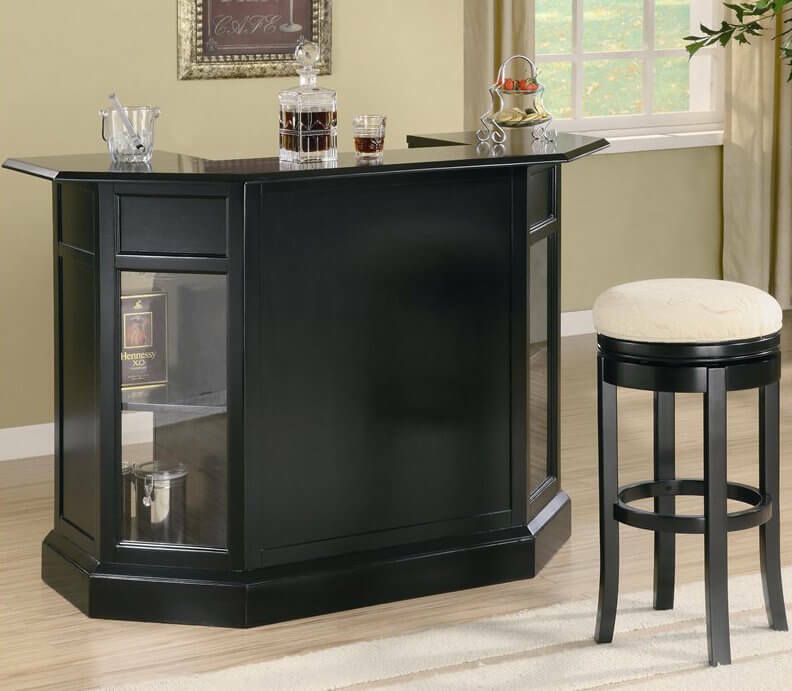 With both swing-out drawers and open shelving for glasses, openers, and everything else you might need, this bar is the perfect way to add some useful elegance to your man cave. 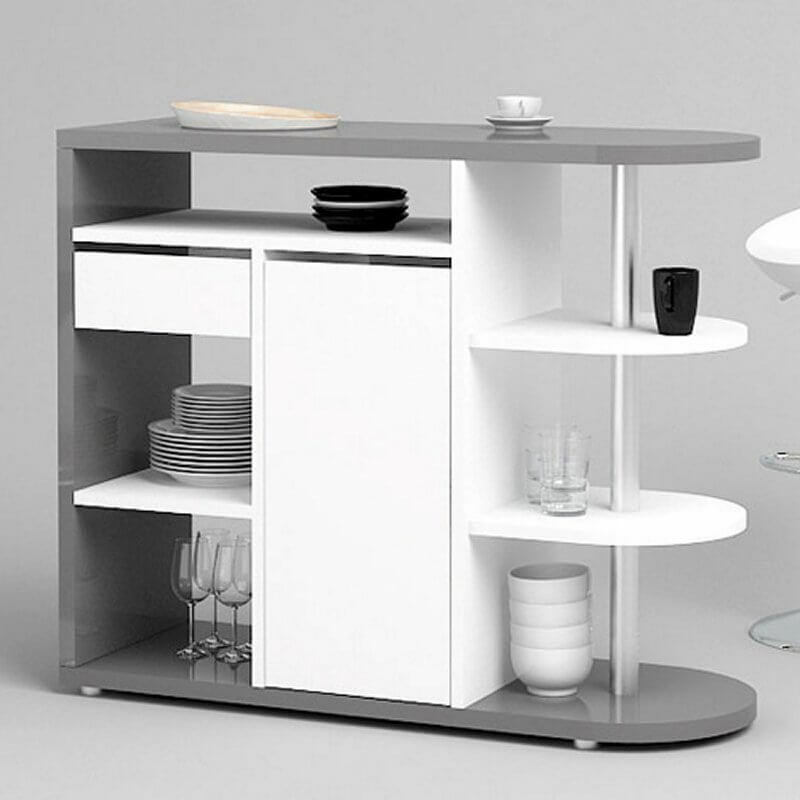 Here’s a sleek and contemporary home bar that’s designed to rest against a side wall for a convenient, small footprint and maximum stability. The curved bar top and stainless steel pole emphasize the modern design, while a bevy of open shelves and drawers make for a useful place to store drinks and dishes. If your man cave is all about masculine, rustic style, you’ll want to check out this bar. Crafted from rich natural wood with a knotty, tough appearance, it’s got all the convenience of a modern home by in a more prosaic package. There’s a built in wine rack, retractible cutting board, and large storage drawer and cabinet for utmost utility. 5. 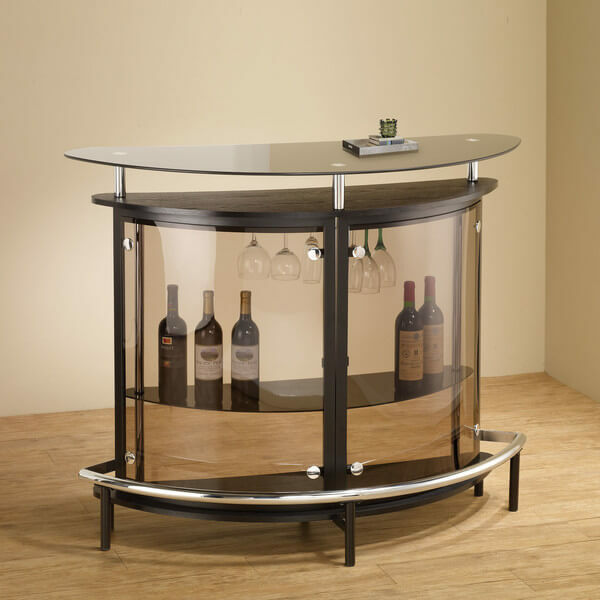 Bar with Wine Storage by Darby Home Co. When understated luxury is what you’re aiming for in a man cave, this home bar fits the bill perfectly. Rich wood meets classic lines in a relatively compact size for all that it provides in terms of storage and usability. The cabinets can be locked for security, and there’s even a lower bar surface for mixing and pouring drinks. Sometimes flexibility is the most important feature, as this home bar shows. Its neutral, traditional styling makes it a fine fit for a variety of man cave styles, but its true innovation is in its folding mechanism, allowing you to store the bar away in a compact space when not in use. It’s perfect for smaller man caves. 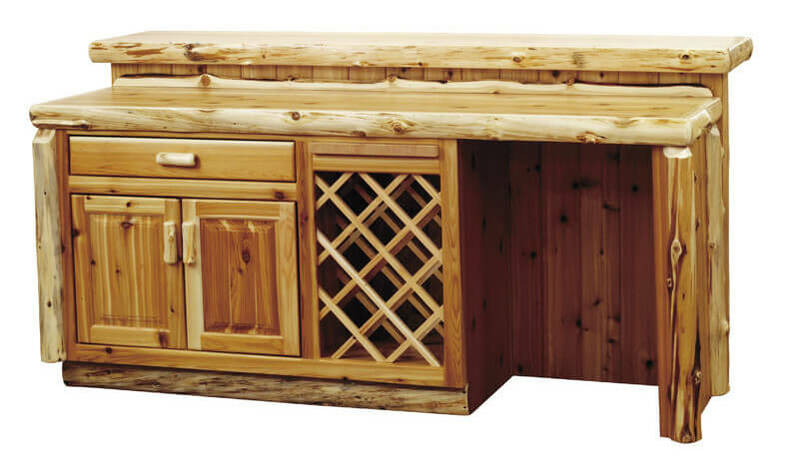 We love the bold, strong rustic styling on this rich wood home bar, perfect for any rustic, industrial, or even traditional man cave setup. With its thick metal piping and broad, thick bar top, it’s a sight to behold in any setting. The entire thing is crafted from reclaimed red oak from 1800s tobacco farms, which will give your man cave an authentically timeless appearance. If you’ve got a more contemporary styled man cave, you might want to check this bar out. 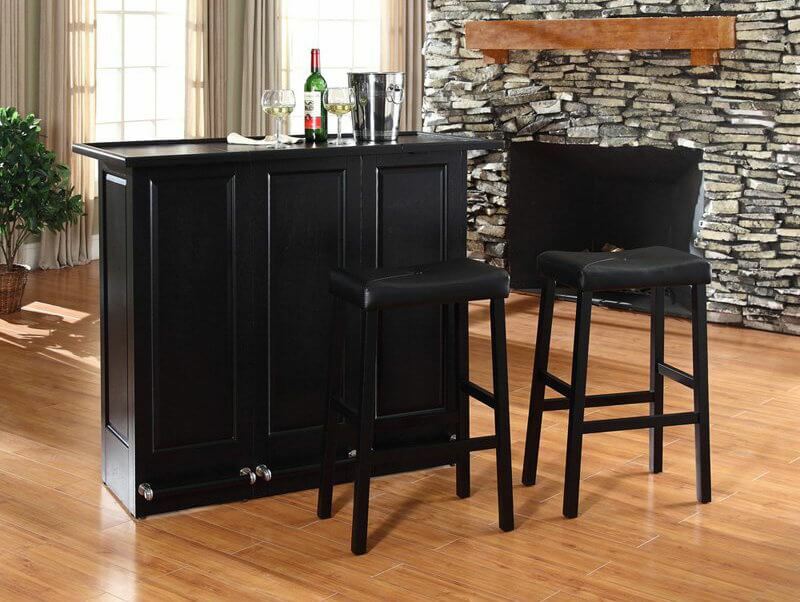 The sleek black construction boasts a glossy bar top and half-octagon design that helps it really stand out in any space. The glass shelf windows add an extra layer of luxury and make for a unique storage solution. 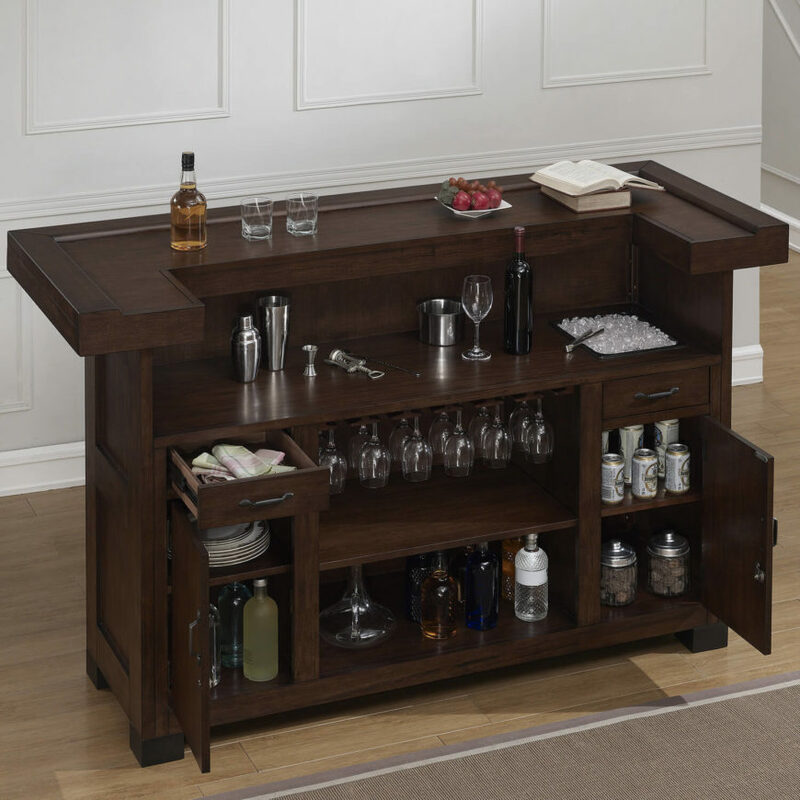 If your man cave leans toward the more elegant, modern end of style, this could be the perfect home bar setup. Glossy black cabinetry, chromed foot rails and hardware, and a tempered glass bar top make for a uniquely rich textural presence. The two-tiered bar makes for plenty of space to mix, pour, and serve drinks, while the glossy look will emphasize a sense of luxury in any modern man cave. 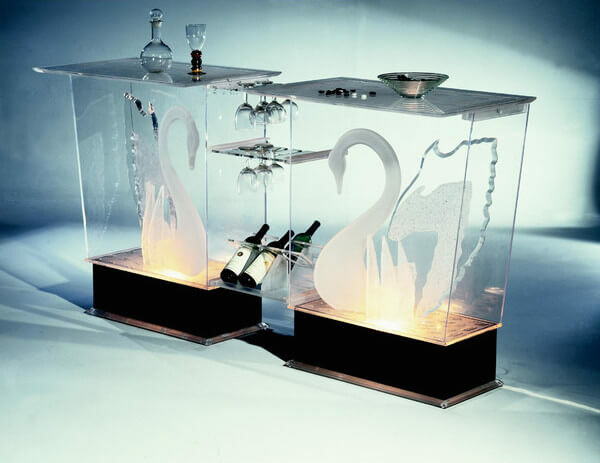 We chose to include this absolutely extravagant home bar because, while not every style is made for everyone, a unique set like this will be exactly what some of you are looking for. It’s a bold acrylic creation lit from within, appearing like a crystalline display case. The bar boasts storage for wine bottles and glasses, and will truly stand out even in the most luxurious of man caves. This barstool is one of the most striking we’ve ever seen, with a simplicity and richness of design that makes it relatively timeless. While it may not work in all settings, we believe any contemporary or modern man cave could benefit from its black tufted leather upholstery and chromed pedestal. 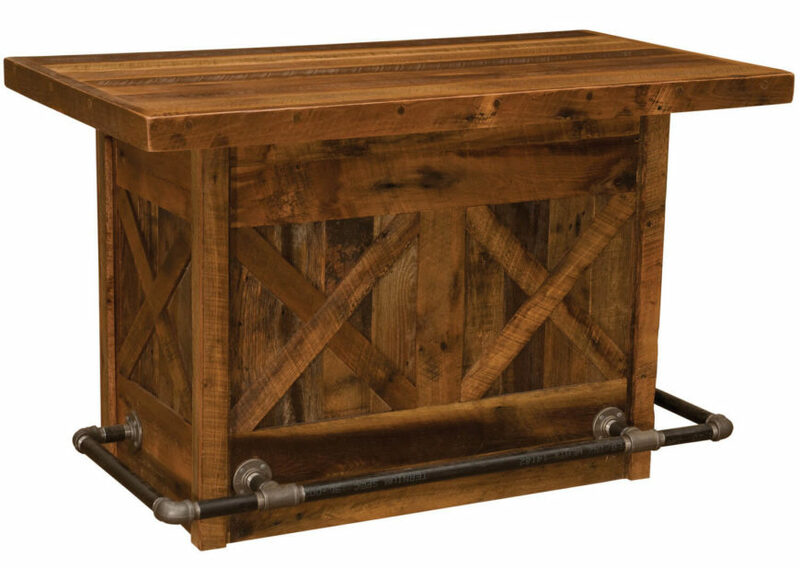 One of the most popular designs for man caves is the most rugged, tough, and dare we say, manly of styles: industrial. It’s popular both because it’s eye catching and because it’s often so very utilitarian. 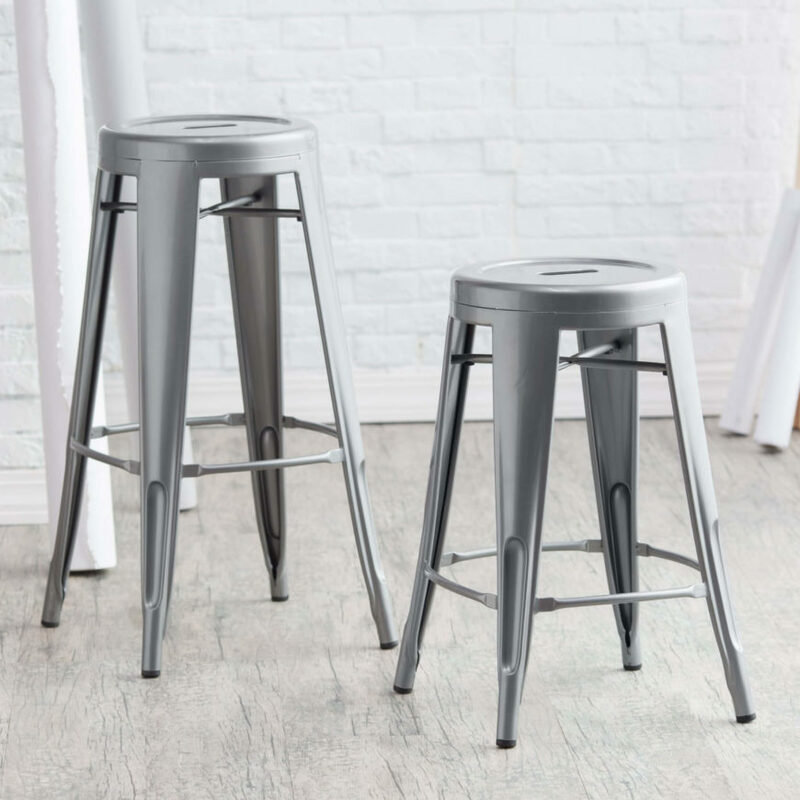 These industrial styled gun metal bar stools are tough, simple, and comfortable, covering all important bases for man cave furniture. 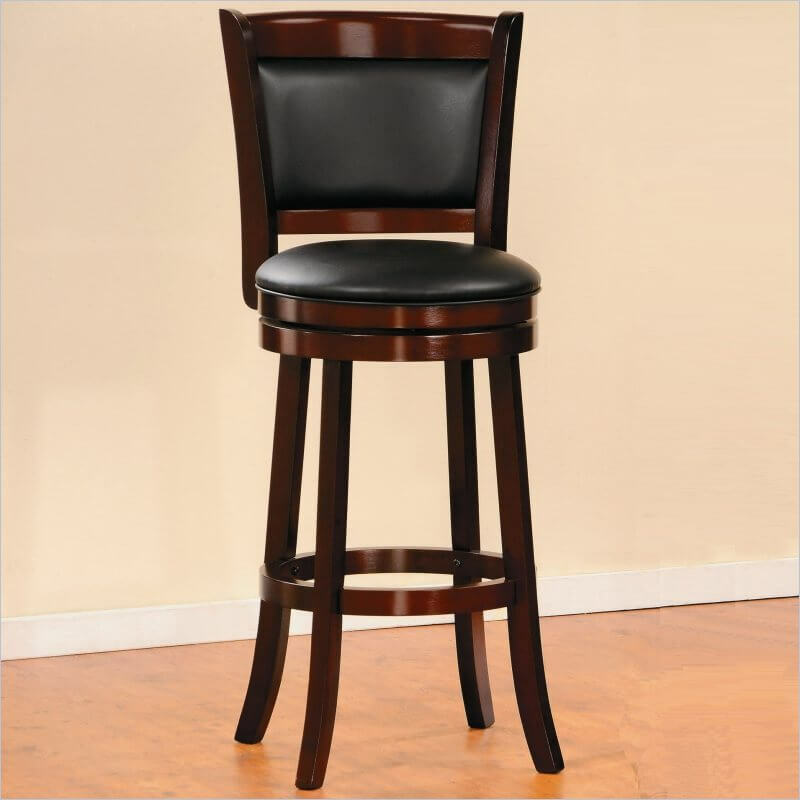 This side-saddle shape is one of the most popular styles of bar stool today. Found in many homes ranging from traditional to ultra-modern the style has a timeless appeal and unshowy elegance that makes it fit well nearly anywhere. For your man cave, you might enjoy the added comfort of its thick seat padding and the richness of the dark wood frame. Similar to our previous entry, the saddle styled bar stools here come in a startling variety of colors, framed in nailhead trim for a uniquely eye-catching look. 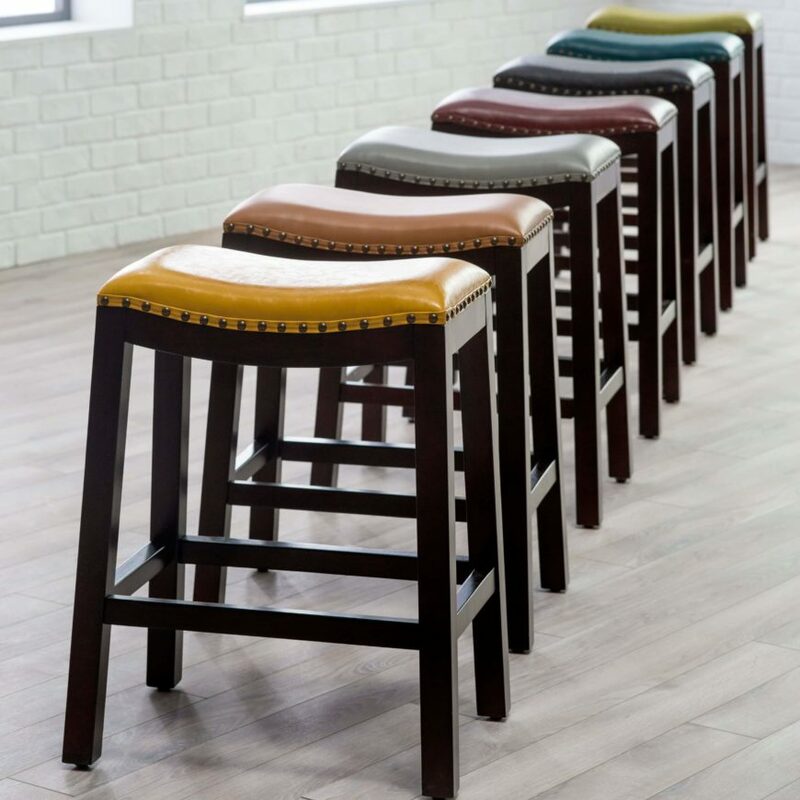 The color options are a big deal, as most bar stools appear in neutral shades. This means that you can add a bit of highlight to a more neutral toned man cave, or match your prevailing colors perfectly with just the right leather upholstered stool. Many man caves are a more casual place, a spot to completely unwind, away from the family, alone or with friends. Some, however, seek to create an elevated space of culture, luxury, and elegance. 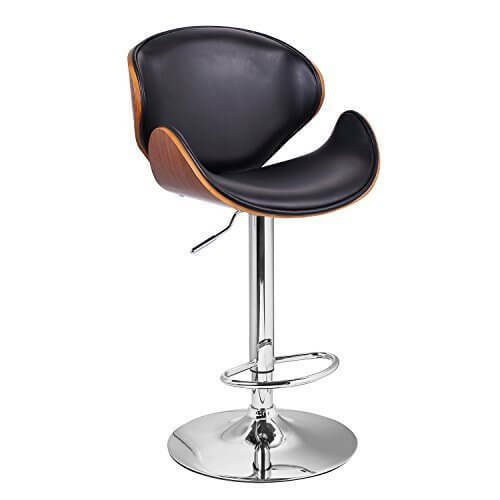 This bar stool is made for the latter type of man cave, with its rich wood construction, black leather upholstery, high back, and solid swivel design. 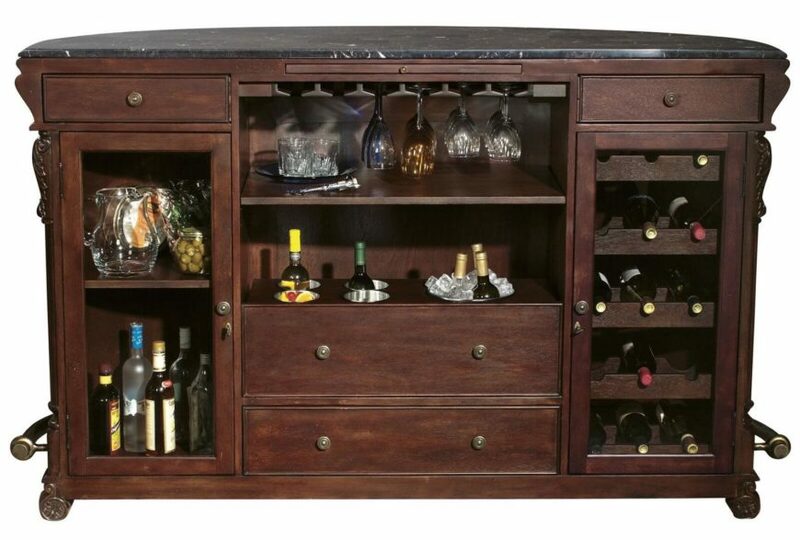 This model is perfectly matched with a rich wood home bar set. This is one of our favorites, a unique stylistic hybrid of a bar stool that flaunts a midcentury modern elegance and organic sense of comfort and style. The chromed hydraulic lift makes for a fully adjustable stool, while the low back and curved seat with black leatherette upholstery makes for a distinctly comfortable, stylish place to plant yourself and friends. We think this would match well with any traditional or contemporary man cave. 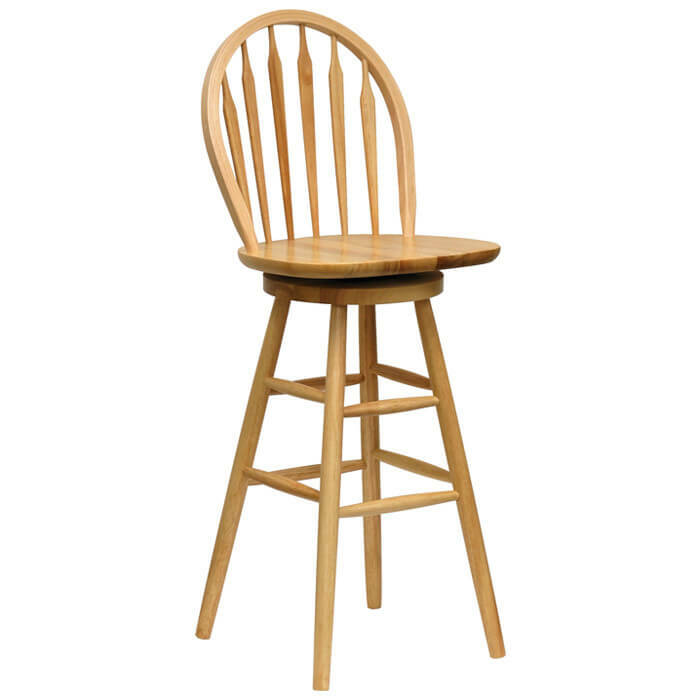 Here’s an example of utterly classic styling, a bar stool in rich natural wood that looks like a grown-up version of everyone’s favorite dining chair. The arched back and simple frame convey a timeless quality, while the solid swivel mechanism and seat top make for a comfortable place to spend time with friends. Style like this fits in with a wide range of spaces, working well in many traditional or contemporary styled man caves. There’s something irresistible about retro style done right. When you see it, you know it. 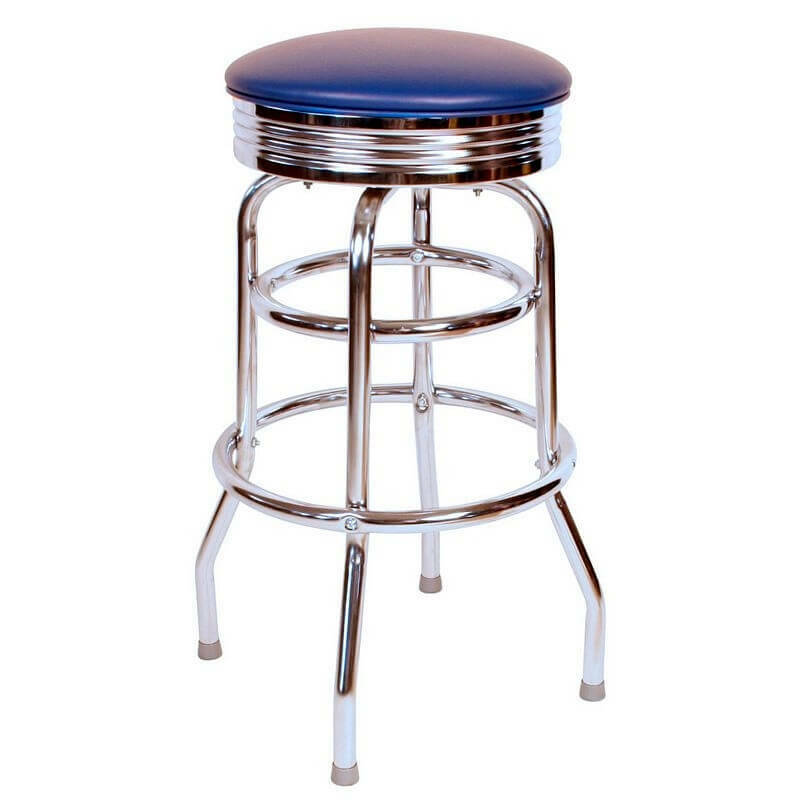 If you’ve got a retro styled man cave, you’ll want to check out this bar stool. It absolutely nails that 1950s diner feel, with chromed legs, a flashy swivel top, and brightly colored upholstery. The sturdy design and classic lines will look perfectly at home in any retro styled man cave. 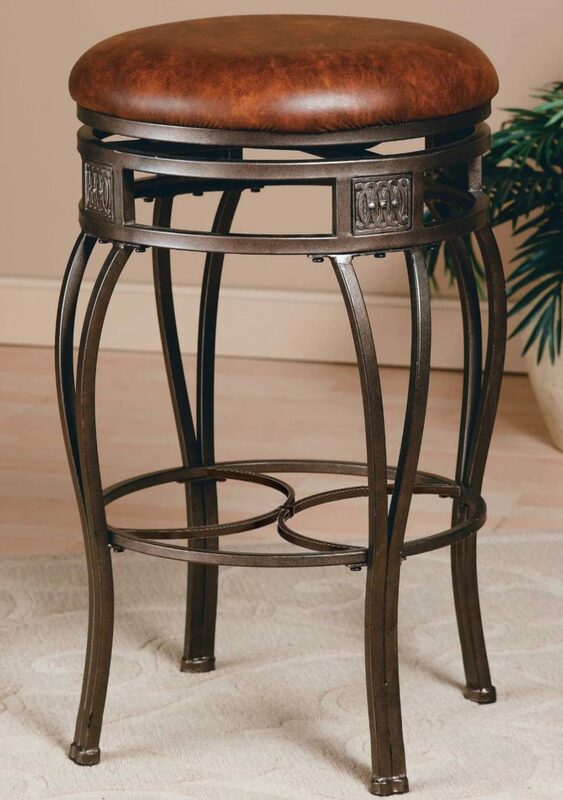 We adore the old steel look of this rather ornate, backless bar stool. The rich, warm toned leather upholstery rides atop an ornate frame for a combination of strong textures and tones. This stool would fit perfectly in any elegant, luxury-oriented man cave. If your room is a place where rich wood and fireplaces appear, a stool like this could be the key to completing the look. 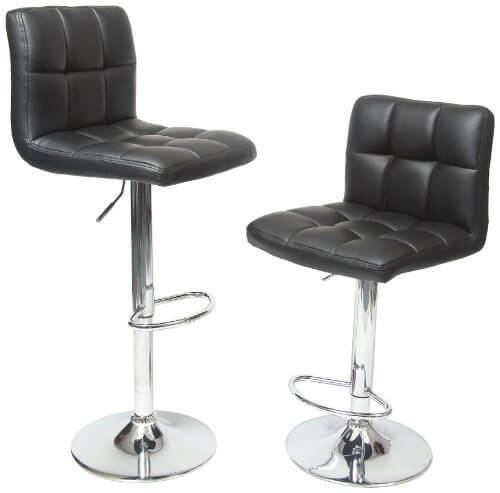 We come full circle back to a sleek and simple contemporary design for our last man cave bar stool. This elegant design features soft grey upholstery over a rich, dark wood frame for a lightly contrasting look that would be at home in rooms of a variety of styles. It’s close enough to neutral to fit in with a traditional man cave, but svelte enough to work wonders in a more modern setting. The high back is a great addition for ultimate comfort.